Hi everyone! Welcome back to Mimosas & Marionettes! 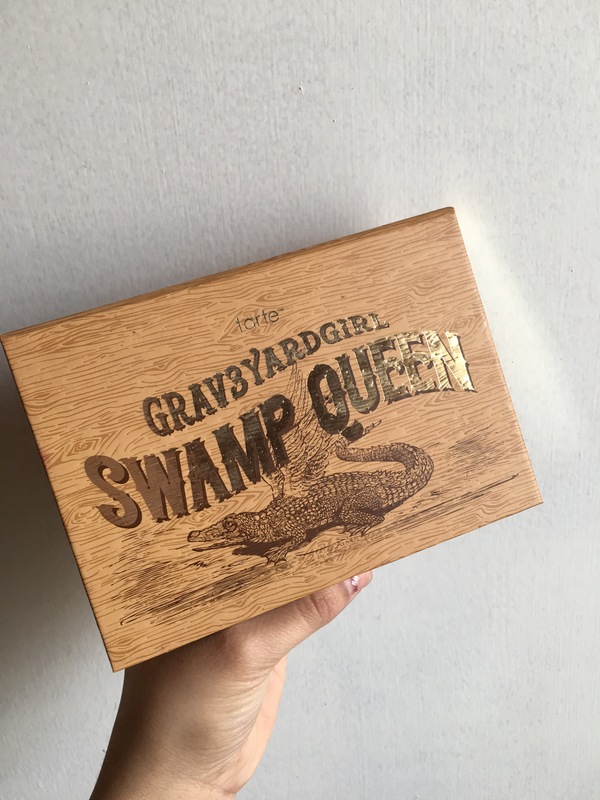 Today I bring you some swatches and a review on the tarte Grav3yardgirl Swamp Queen palette. This is a tarte collaboration with YouTube personality Bunny Meyer. If you dont know who she is I will link her Youtube Channel HERE so you can check her out! She is such a hoot! You’ll laugh with her in every video she posts! I’ll also link this palette directly to the tarte website. 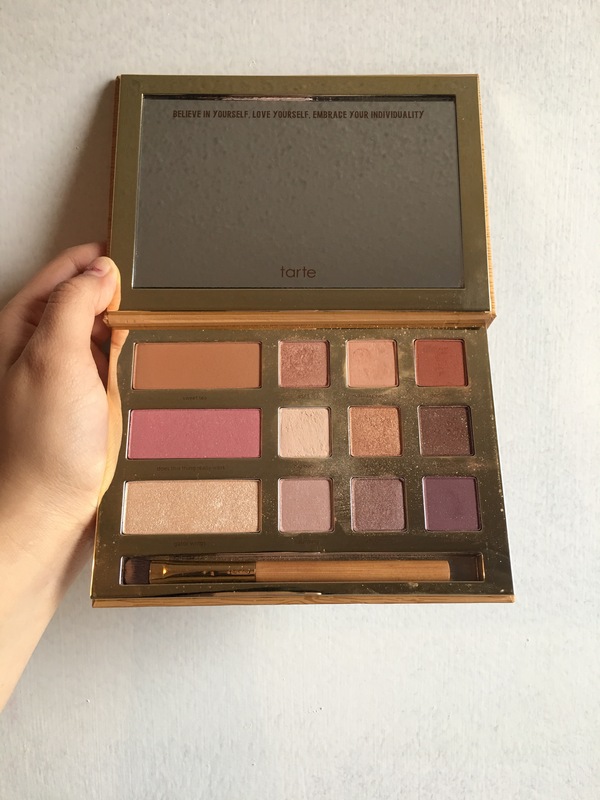 You can purchase directly through Tarte RIGHT HERE! I didnt take a picture of this Palette in its original box because It looks exactly like the palette itself which I though was really awesome. If you want to see what the original packaging looks like you can check it out on their website. Here is a glimpse at the inside! 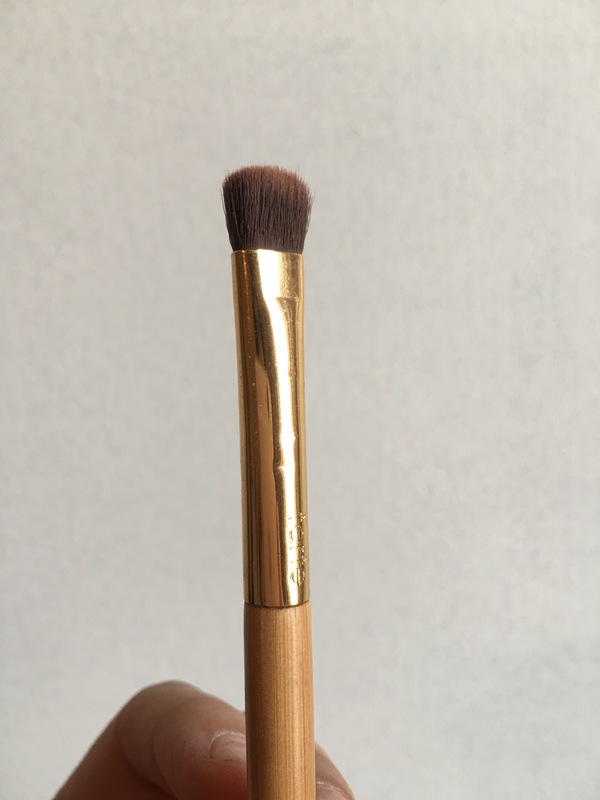 When you first open it you are blinded by the beauty of this gold metallic trim the palette features as well as stunning colors that I cant wait to swatch and talk to you more about! Don’t mind how dusty mine is! I’ve had it for about a few months now. First I want to talk about the brush that it comes with! The brush also shares the unique aesthetic as the outside. I thought it was very chic and elegant. I was so excited to see it came with a brush because a lot of palettes don’t. 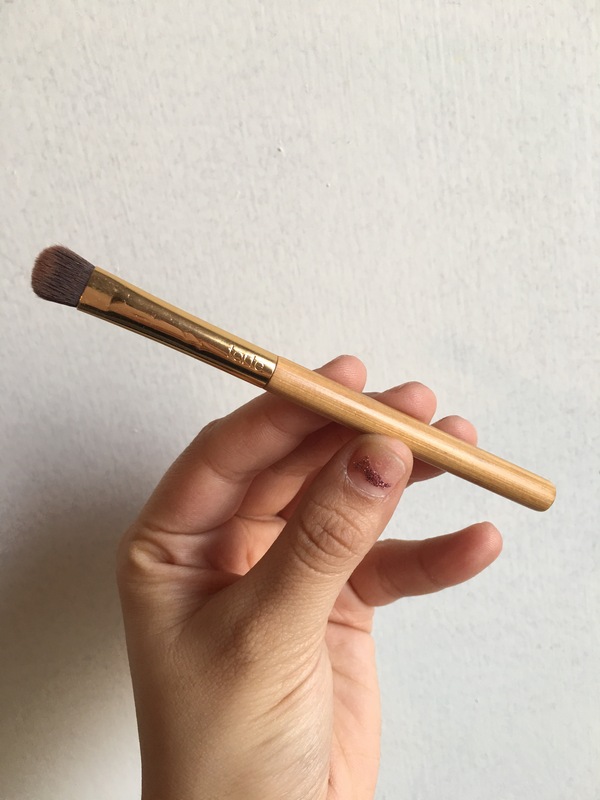 The gold metallic tip and the wooden handle are so chic! The bristles are very soft and blend the product out very well. It’s fluffy enough to blend your crease but also perfect for packing on product. I definitely feel like a million bucks when I use it! 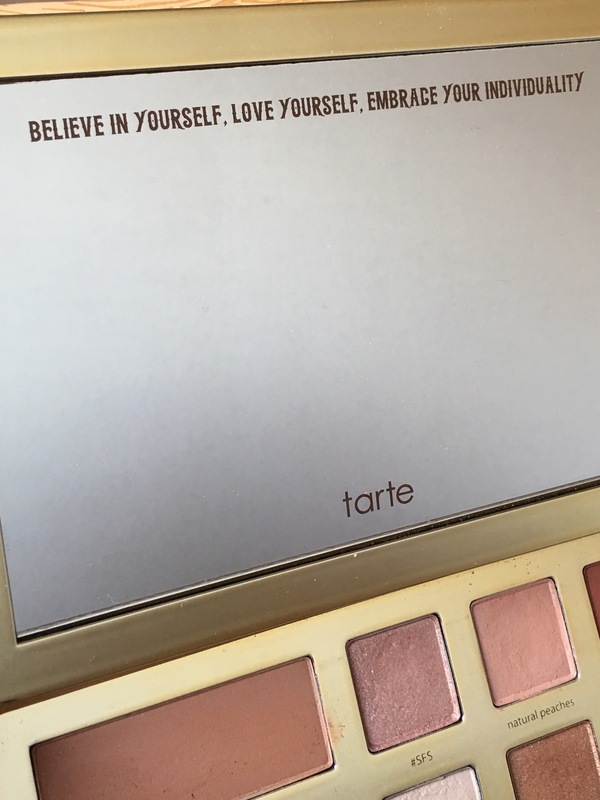 Another thing that really stood out to me about this palette was the quote at the top of the mirror. Such an inspiring quote that makes me think of Grav3yardgirl so much! Her videos are so inspiring! Okay lets move on to the actual eye shadow swatches and names! Lets start with the top row of eye shadows which are to the right of the palette. From Left to right the swatches are #SFS, Natural Peaches, and Dogman. #SFS is very shimmery and light. A great transition shade as well as the perfect lid color when you are wanting a natural look. I love this shade because it can be used to create lots of different looks. In my opinion it’s the most versatile shade in the palette. Natural Peaches is perfect for that crease girl! It’s not as shimmery as the rest and you can blend this shade into any look. It has such a cute peachy tint that is very unique to this palette. Lots of makeup brands lately have been on a peach kick and I am so on the bandwagon. This shade is also a great transition shade for any day time looks you might want achieve. Dogman has got to be one of my favorite shades in the palette, Its also more of a matte shade just like Natural Peaches. Its very unique and a little grungy. Its almost a dark dusty brown but has some red undertones which I think is perfect when you want a more dramatic look. It honestly reminds me of East Texas which is where I grew up. This dark rusty color is almost the color of the clay dirt in Nacogdoches, TX – The oldest town in Texas! The next three shades are on the middle row of eye shadows. Since this picture was taken a bit slanted these colors are listed bottom to top! These shades are called Big Baby, Sassy Bun, and Sippy Sippy! Big Baby is my go to pale rose transition color as well as just over all lid color. I also use this shade right underneath my brow line to give it a little pop when I’m not feeling extra. This adds just the right amount of highlight without all the glitter. Its also more on the matte side than most shadows in the palette. I love this shade so much and find myself using it in almost every look I do with this palette. Sassy Bun is a copper golden shimmer shade with a massive pop of color. I love swathing eye shadows that blow you away when you do that first swatch and let me tell you this was one of those colors that just sticks out! Its gorgeous! During the day time I add some of this to my outer corner and at night I like to add it to my lower lash line and blend it all the way into my outer corner for a more golden smoky eye if that makes any sense! Sippy Sippy is a darker brown and it goes really well with all the colors in this palette. It reminds me of Hot Chocolate and It’s the perfect smoky eye shade. I also love to blend it into my outer corner and lower lash line for a night time look. You can’t really tell in the picture above but it has tiny golden glitter specks. I’m sure I’ve said this a million times already BUT I LOVE GLITTER IN EYESHADOW. If you are a beginner please be very careful applying any shadow with glitter onto your eyelid. It can get messy and end up in your eye which will cause you great pain. Apply with care and get your glitter on girl! The last row of eye shadows are called Haunting, Uncommon, and Mandog! Haunting is a beautiful dusty rose color with beautiful itty bitty tiny specks of glitter. Definitely more shimmery that I would have liked for it to be because this would’ve been a great creamy matte color for this palette. However it is still gorgeous and looks stunning day and night. I love blending it into my outer crease. Uncommon is a slightly darker dusty rose with more copper undertones and you guessed it… its another glitter shimmer shade. I absolutely love this shade. It looks gorgeous on the lid and I also use it on my lower lash line to add dimension and depth to my looks. This is such an everyday shade! Mandog is so unique. It’s a dark purple almost charcoal burgundy shade. I don’t know how else to describe it because it’s truly one of a kind. I feel like I never see purple shades similar to this. I had a serious debate with my best friend about this shade because she says that it’s not purple so please tell us what you think down in the comments! We both love the shade and usually wear it on my outer corner and blend it into my outer crease just a little bit for a more dramatic look. Okay so the last shades are going to be the cheek shades. Let me show you a quick video of them in action! All three cheek shades are very glittery and come with extra shine so if you are not a glitter or shiny girl then this palette might not be for you! I decided to include this close up of the three shades before I talk about them in detail because I think in this second shot you can really tell how much glitter is really in them. Both the Blush and Bronzer have tiny glitter specks in them which I thought was so beautiful! 1. The Highlighter is called Alligator Wings, which is perfect for Grav3yardgirl’s Brand. Every time a new subscriber joins her #swampfamily an alligator gets its wings! HAHA! Which i think is a hilarious way to get people hyped about your channel! Let me tell you though this highlighter is LIFE! I am in love with it and I use it frequently not only as a highlighter but also an eye shadow! Once you get your hands on this you will know how incredible is it. I hope Tarte decides to maybe sell these cheek shades individually and if I had to chose one it would definitely be this highlighter! 2. The Blush is called Does this thing really work? which I’m sure was inspired by Bunny’s series of testing products “As seen On TV” on her YouTube channel. It’s a very entertaining series so be very careful because you might spend all night watching every single one. Its a gorgeous blush but like I said before if you don’t like glitter then you wont like this blush. I use this mainly when I’m going out on the town with my friends or on a date with my BF. It makes my cheeks glow for 1,000 miles! I blind people when I walk down the street. It has tiny specks of glitter and let me tell you those tiny specks of glitter are sent from the heavens and bestowed upon your precious cheeks to make you feel like a million dollars. It is very pigmented so be careful when applying because you can easily apply to much. 3. The third and final cheek shade is the bronzer. They named it Sweet Tea! I’m a sucker for bronzer. Most of the time I use it to contour and to add a little warmth to my face. YOU CAN NOT USE THIS BRONZER AS A CONTOUR BRONZER. Mistake! I used it and it was terrible. I think its because it has glitter in it so that didn’t really work out. It’s also is VERY PIGMENTED. Way more than the rest of the shades in this palette. I do however enjoy a little bit of this shad on top of my contour to bring in more color to my face and of course to bathe myself in golden glitter specks. Those were all 9 eye shadow swatches and all 3 cheek swatches as well as what I think about each shade! You have to let me know what you think about these shades down in the comments! Which ones are your favorite? The cool thing about this palette is that it’s really all you need to do a full face! It has 9 different eye shadows but also comes with a highlighter, a blush, and a bronzer! Isn’t that awesome? Imagine being able to travel with everything in one single palette. Not to mention all the awesome looks that you can create with 9 different shades! Do you see now why I had to purchase this? I couldn’t resist. Overall this palette is a 10/10! One of my favorite Tarte purchases! PLEASE leave me a comment down below letting me know your thoughts on this palette! I want to know EVERYTHING! lol! If you liked this type of post also let me know that way I can keep bringing you reviews and swatches from any new products or your favorite brands! Thanks again for stopping by today and I’ll talk to you in my next post! Lets be friend on Social Media!